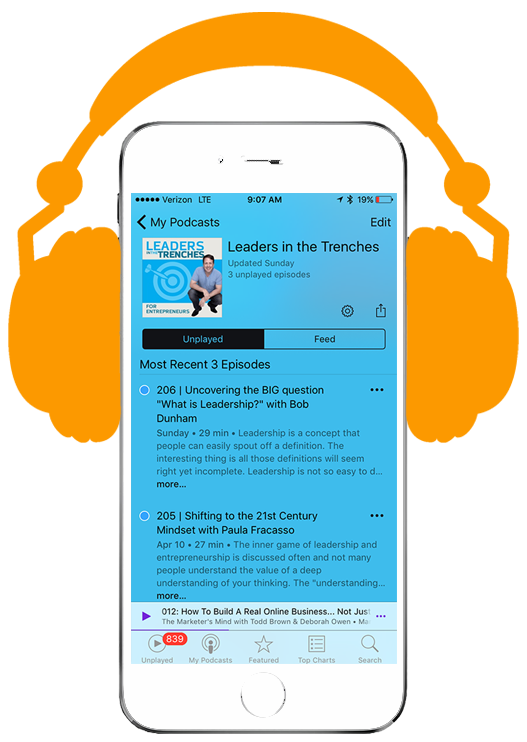 Listen to leaders in the trenches and your host today is Gene Hammett. Gene Hammett: Hi, my name’s is Gene Hammett. I’m the host of leaders in the trenches. My big question for your day is, when’s the last time you revamped your sales process? Do you even have a sales process or do you kind of wing it? I’ve found that having a very defined sales process that you know how to follow, you know what works. You know when you have bottlenecks and you are continuously improving on that. It works best. It works because you are putting intention to being better at this thing called sales. No. If you resist sales or if your team is not performing at the highest level, this conversation today will really help you. My guest today is Mo Bunnell. Mo wrote the snowball system. He’s a friend of mine. He actually turned me down from a sales job, but eight years ago. Gene Hammett: We talk about that in there and he shares a little secret. He confesses that it was a huge mistake. It’s kind of a funny moment, but I share with you mo because he’s got some really good, strong insights on what does it take to connect with people. We talk about the reason why you want to slow down to speed up. We talk about some of the things you can do to generate leads even when you’re not a traditional lead generation kind of company. Very specific things that we go through in this conversation just for you, so enjoy the conversation I had with. Gene Hammett: Hey Mo. How are you? Mo Bunnell: I’m good. Good to see you, Gene. Gene Hammett: It’s great to Have you at leaders in the trenches. A little bit about in a minute, but I’ve already let her audience know a little bit about you, but I want them to hear it from you. So who do you serve until serving? 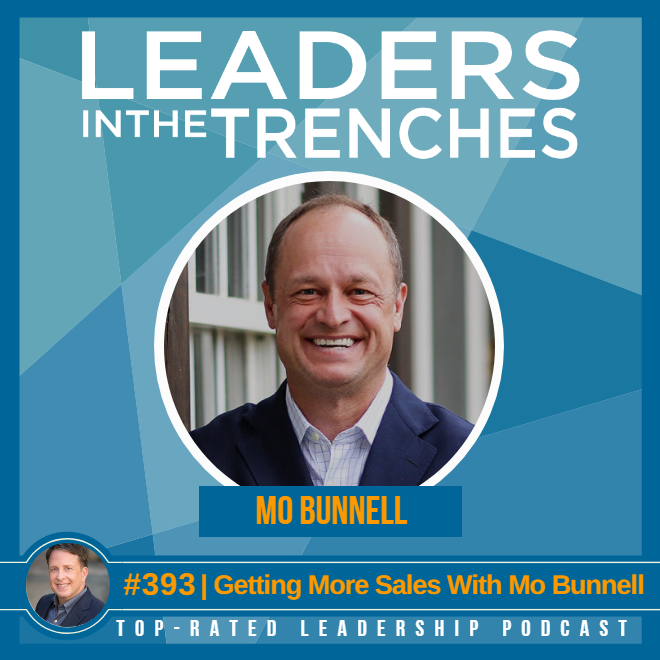 Mo Bunnell: People that are sellers and they’re experts, so people that have one foot in the delivery of service of a business owner or they could be a professional, like a lawyer, accountant, consultant. They can be an account executive at a big organization, but people where they have one foot in delivery and they have one foot in finding people to purchase that expertise. That’s sort of our, our perfect client. Mo Bunnell: It was a long time. Gene Hammett: It was what now? Eight years ago I interviewed for your company and it and it broke my heart when you said no, but I am glad to see full circle coming back to you. Have you on the. On my show is eight years later, so it’s great to talk to you about this and at that time I went through one of your training workshops on sale. I thought it was fantastic. It was. It was game changing in the sense of you were really focused a lot on how well do you understand the person sitting across from you because they probably don’t think exactly the way you think. Tell us a little bit about where that word came from and what I’m talking about. Mo Bunnell: Yeah. well, I have to say what a fine point on something I still regret not hiring you, but everybody around big marshall and Darla we talk with you offered and we’re so excited that too just to see your rise and in your book come out and all the people you’re helping get super fun. LIke I get. I get joy out of seeing my LinkedIn feed and senior interviewed Seth Godin or whatever. It’s just the thing is I’m excited. So thinking about being pliable, flexible in our thinking and in adapting to the person on the other side of this. There’s a lot of science in how people think and there are four major ways, two sorts of opposing pairs. One is strategic versus detailed, you know, people that aims and big ideas and visions versus how are we actually going to get there. Those are sort of two opposing pairs and the other opposing pairs analytical logic and numbers and math and quantitative versus how do people feel, you know, sort of analytics versus empathy. Mo Bunnell: And those four together basically comprise how, how we all think at different times and we can teach people how to pick up the clues for how others think and then how to adapt the way we’re positioning what we do and ideas and we can create a sort of buying experiences that are adapted to the way somebody thinks and how they want to buy in as opposed to the way we would want to buy it. Gene Hammett: It would be so easy to sell someone who thought the way we thought or. Right. Mo Bunnell: Exactly. That’s a lot easier. Gene Hammett: I’m a very strategic thinker. big vision kind of stuff. No data. Where do you come in on that? Mo Bunnell: Yeah, I’m the same. I think that’s why we hit it off. Like that’s my number one. And then then my number two is pretty analytical. So like when I buy a car, I think of the brand first, like I want a certain brand and look and what that brand represents and then I go out and get a great deal on it. But I wouldn’t sacrifice brand for a good deal. Like I wouldn’t put those in the other order. Gene Hammett: And you know what I learned, this was eight years ago and you’ve been extending that, amplifying that since then is how do you pick up on those clues of what is important to the other person? So for example, if they’re detail-oriented, no, I don’t know if you remember these off the top of your head, like what Is one of those questions? It comes up if someone’s detail oriented. Mo Bunnell: Oh yeah, well I teach this every day. So I think about it. I literally, when I’m even watching a movie, I’m thinking, oh, that’s a such and such quadrat thicker and you know, movies and archetypes and stories are all built around these four ways of thinking. So a clue around detailed is somebody might ask for an agenda ahead of time. Mo Bunnell: If you get off track or you’re five minutes behind, they would notice they might not care as much about how your high-level brand or how, what your positioning is, they’d want to know how does it work, how do we do implementation, how do we do follow up? Things like that. So they get a lot more down into the weeds of how things actually occur. Then sort of the high-level sort of high-level concepts. Gene Hammett: Well we. That was a little primer for you guys listening in here about sales and about some of the thinking here, but you have created something called the snowball system. It’s your new book that’s come out. Just tell us a little bit about what this means. The snowball system. Mo Bunnell: Yeah. Well, and I’ve got a visual right here. So product placement, product placement, yes. The snowball system. The idea is that in the visual help, I think is that when we do read would seem like relatively small things, but we do them consistently over time. Mo Bunnell: Always playing the long game, always investing in relationships, always investing in ourselves to make ourselves better at business development are, or the delivery of our services. When we do these things all the time, it creates momentum. Almost like that snowball rolling downhill to the point where at some point your business is rolling so fast, you almost couldn’t stop it. If you try it, your business gets hit by a mack truck. You’re still okay and a lot of people don’t feel that way. They sort of feel like it’s the other way. They’re pushing a snowball uphill. The act might be because they’re playing the short game. They’re trying to sell instead of growing relationships, they’re trying to close the monthly books. Great. Instead of doing things that help them sell a year from now and what the snowball system was bad as a comprehensive system about how to do all the things around managing your opportunities, managing your relationships, and managing yourself. Mo Bunnell: So you’re always one month later, one month later in a better position to grow your business. Gene Hammett: So let’s dissect that a little bit. You know, one of the things that I have with my clients and even my business is there’s a lot of opportunities right in front of us. Gene Hammett: Some of it’s better than others. So what within the snowball system, what, how do you help people understand the right opportunities? Mo Bunnell: Oh, that’s great. Well, there’s a whole chapter on how to position yourself uniquely and then how to target, prioritize the exact types of organization that fit that positioning. And we actually go through a mathematical model where you have to force rank your store forest to force rank the criteria to choose. We help people decide in that chapter three to five criteria that they can choose that align with their perfect prospects and then you even rank organizations on those criteria. Mo Bunnell: And what’s so fascinating about that in our, in our live classes and the feedback we’ve got from people that have read the book is almost always people say, oh man, I’ve been spending time with the wrong people in the mental heuristic that’s underneath that is that behavioral science tells us that we tend to spend more time with those that we already know. We spend time with the familiar as opposed to going out and finding ways into the people that we should know and coming up with those targeted in a specific list. A really important to do that well. Gene Hammett: Well since you said it, I’m going to go ahead and ask. When our audience is thinking like, you know, what are your insights on how do you reach out to people that you don’t know yet to bring them into and see if they’re a good fit for your company? Mo Bunnell: Yeah, well there’s a whole chapter on that call it lead generation and the idea is we we we teen elements in our live training. We chose the top nine in the in the book snowball system and they’re everything from speaking at conferences to asking for referrals and things like that, but with every single one of those way, those means of getting in the door. We break it down into steps. How do you ask for a referral with a way that leverages behavioral science and psychology and is a way in a way that actually adds value to the person you’re asking as opposed to feeling like you’re leaning on them. Hey Jeremiah, I make my living, but I put food on the table for kids by asking for referrals. Can you write down the names of five people on this list and I’m going to harass the heck out of. That’s what it can feel like you’re the wrong way, so we’re going to teach folks step by step how do you do it the right way that feels authentic and genuine like you’re a natural human being, not some like referral asking robot. Gene Hammett: Now, I want to dive deep into this because I was thinking about our interview today and I know where you come from in this, but I want you to share with our audience. A lot of people think that they can just create one email that they can kind of. I’ll say the word blast, I don’t think blasting emails is a really good thing, but you take a different approach to this and I don’t know, you know, one of the things I use with my clients is, you know, can you identify 20 opportunities? Twenty perfect clients. Yup. And what if we built all of our activity around those 20 clients? What do you use specifically around engaging with those 20 clients or whatever it may be. Mo Bunnell: You got it. So one thing that would be common around if you had sort of a list of 20 organizations you really want to get into, maybe you know people at four of them and you’ve got referrals than get into five and you’re 11, you don’t know. One thing that would scale across all 20 most likely is a concept that we call give to get a gift to get is typically for service-oriented kind of organizations is what can we do in an hour or two on our dime. There’s no charge for it that would add a tremendous amount of value to the prospect. One be relatively easy for us to do so there’s some scale to it. Number two, and most importantly would lead to a next step, maybe not all the way through even a purchase, but would lead to a next meeting to start talking about a purchase or something like that. Mo Bunnell: Whatever the next incremental step that’s possible as and when people have those three criteria, easy for us, valuable for the prospect and leads to the next step, then they can take that give to get and they can sort of build it out, whatever that experience is, and then go find ways to offer that as a valuable introductions to every one of those 20 and then the different lead gen models in the book teach how to do that. How do you offer that to people you already know, but maybe the people you know inside an organization aren’t the right exact people to be in that experience, so how to expand it, referrals, how do I use that gift again as a way to give a gift to the person driving the referral and to the prospect and then on the cold side to get 11, let’s say you don’t know a way into there’s legion solutions for how do you take this great gift you want to offer and get it in the. Mo Bunnell: Get the idea in front of the organizations that are on that list of 11 so that you have a high likelihood of getting that meeting. Does that? Gene Hammett: Yeah, it does. When you talk about this, no. One of the things that I want to ask you and I think about this all the time with my clients, they want more growth. They want more, more speed, accelerate all this good stuff and it’s like we have to slow down to go fast. Mo Bunnell: I like that. Gene Hammett: And your work is around slowing down this sales process and like let’s build a real relationship. Let’s build something based on a connection and value and tell us a little bit more about how you do that or and why it’s so important. Mo Bunnell: It’s super important. A lot of times in business development to your point, people can want to take a thing off their to-do list and the way that’s easiest for them as opposed to the way that has the highest chance of success. Mo Bunnell: So here’s a simple example. We go into detail on this in the book. Some recent research out of western university up in Canada and a Cornell found that a face to face ask or request had a much higher likelihood of success than an email ask. And then that makes sense, right? like if we’re face to face with there’s a higher likelihood we could overcome an objection or really talk about what they mean and you actually have to sort of providing some kind of response like were female. You can avoid it, but most people don’t understand how much more powerful that face to face ask is. And in our classes will say, hey, what percentage more powerful do you think face to face is over email people, right to oh, 30 percent or 80 percent, 90 percent. It’s actually 34 times 34 x more valuable. So it’s immensely powerful to be face to face. Mo Bunnell: So like if we were back To our narrative from before, if we were going to offer a gift to get to somebody, we’d be far more successful instead of firing off an email to the blast email. you mentioned to 20 people, we’d be far more successful in picking up the phone. Maybe we’ve got a call with one of these organizations next thursday. Let’s wait until then, let’s cover it on the phone. That’s got to be close to face to face. So it’s more about being efficient and orchestrating or activities in ways that provide the highest flow through rates as opposed to just firing things off like you mentioned. Gene Hammett: And that’s slow down to speed up. Mo Bunnell: I love it. Really. I really love those words. Gene Hammett: You’ve got to talk a little bit about the second part of your subtitle, which is about turning clients into raving fans because one of the things that we all know is a client that’s happy is more likely to give us referrals and those referrals are something that really can drive the business. It’s. I don’t think they’re completely dependable unless you build systems into raving clients. So tell us a little bit about how the snowball system creates that. Mo Bunnell: I love that there’s a ton of science in that. My favorite researcher on this is Jerry Burger out of Santa Clara, but he’s done an amazing amount of research that shows people buy more from people they like and there’s other researchers have found people negotiate less with people. They like. Likability is really important and one of the things that we can do, and we talked about this in the chapter and snowball system, is not only to manage our opportunity pipeline. Most organizations are pretty good at that. They’ve got a CRM or some kind of mechanism to track where deals are, but we can also measure our relationship and we’ve got seven steps that we see that you can validate. Mo Bunnell: You can look at the behavior of the customer, the client, and you can look at what they’re doing and validate are they a step one or step seven, step one, simply I want to meet them, but I haven’t met yet and it goes two, three, four, all the way up to seven, which is they are proactively providing referrals for us without us asking, so instead of us judging or the health of our relationships on whether people hug us at the end of the meetings like, oh, Jim loves us. He hugs do. After every meeting. Well, newsflash, Jim Holmes, everybody turns to your competitors for two seconds longer, but by having a process to take our most important relationships, know where we’re at and know what we need to do incrementally to add value, to get them to the next step. That is incredibly powerful and it’s playing the long game and most importantly it’s fun because then people are just there. They put themselves in the mindset of being helpful instead of selling and managing that relationship can be a blast for organizations to tackle. Gene Hammett: When you do all this work, you’re working with a lot of experts and the this and they get caught up in their head that people should want to do business with them. They should reach out. They should, you know, get that great email. Like I got a. I got a fantastic email today from someone who wants to bring me in for speech and Toronto in February. Gene Hammett: Be honest with you. That doesn’t happen often enough like we want. I want more of that. I’m willing to get into the world, but what do you say to people? They’re like, you know, I don’t really want to do lead generation. I don’t really want to do sales. I want them to, to want me and want our company. How do you get people to break through that pattern? Mo Bunnell: Yeah, it’s interesting. The probably the first part is the mindset that there’s a lot of people that don’t like the word sales. They know what the content, like the concept of sales. They’d rather sort of fiddle with their gadget or their service and really think about the delivery of that and that’s awesome. I mean that’s part of it, but as an entrepreneur, business owner, nobody is suited like you are to grow the business because you’re the owner. You know the sweat that went into this and if those people can have the mindset that selling is actually helping and that lead generation is all about going out and finding valuable ways to get in front of people. You’re going to help in that first meeting. They were like a give to get or whatever, but you’re going to orchestrate the whole process. Mo Bunnell: So in that first meeting you’re helping. Then it takes the idea of selling off the table and what we teach and especially in that chat around lead generation is how do you make it so that your lead gen efforts are super efficient and successful and success makes you want to do it more. So if you ask for referrals, the bad way that I sort of roleplayed it makes you not want to do it again. When you offer the good way and that it’s valuable for the referral provider and the person they’re referring to you to now all of a sudden it gets fun and you want to do it more. So it’s all about having the right mindset, helpfulness and doing these things that actually are successful and then you want to do it more. Gene Hammett: I did an interview years ago with David Nagel. I don’t know if you know him. It’s a mindset coach, but a big part of that is about what you’re talking about and sales is not something you do to someone. It’s something you do for them. Mo Bunnell: I love that. Gene Hammett: And that’s part of your gift. Again, it’s like you’re going to get value out of this before you spend money with me. Gene Hammett: You’re going to really understand what the problem is probably and no, we’re path forward. If you want to work with us, great. We’d love to help you because we helped you figure out what the problem was. You’re. You’ve got a leg up, so I appreciate you sharing this with us today. What’s, um, what’s one thing that you wish people would ask you about sales, but they rarely do. Mo Bunnell: Oh wow. That’s a really great question, Gene. I think it’s actually about mindset. I know I’m going back to something we just hit on, but a lot of times people want to dive right into our process. Mo Bunnell: You know, how does it work? How do we scale across our organization? How do we get people doing the right things and those are important, but probably the most important thing is we’ve got to help people understand that selling is nothing more than being strategically helpful and if we can help them understand that, that’s the case, and then show them mechanisms done how to do it efficiently, then they can. They can be great at it. It’s almost like I’ll summarize it this way. Everybody running a business as a business owner, they’ve got this core craft that they’ve got a thing they’ve built, they’ve got a service, they provide whatever it is and they’re super proud of it. It works that they’re growing and hopefully things like that. Well, the craft that went into that was deep. They spent years or decades getting great at business development as a craft every bit as deep and complex and nuanced is that if they enter it with that mindset about being helpful, that’d be great. Gene Hammett: Well, I’m glad you shared it because I truly believe that mindset is something that a lot of people don’t want to talk about. They feel like it’s overdone, but I feel like it’s such an important piece because if you don’t have the right clarity of mind, you’re not open to these new ideas. Like you know, you’ve got to be open to the concepts you talked about in the snowball system. You know, reading a book or listening to this interview and you have to ask yourself, how open are you to looking at this room? New perspective. Mo Bunnell: That’s exactly right. My favorite people in our classes and then I’ve read the book are the folks that are already like 99th percentile, great at business development and they’re the same people that are like stopping the facilitator saying, what did you say that I want to take a note on that they’re striving to get to that next, incremental it better. Those are the. It’s the folks that are, whether they’re just starting out or that, that example, all the people that just want to get better, they’re the ones who are going to get better. The people who say, oh, only Gene good at business development. There’s some before they start. Gene Hammett: Right. Well, I appreciate you being here and for the audience wanting to get in touch with you or buy the book, where would you direct them to? Mo Bunnell: Yeah. Two places. One is, um, to get the book snowball ystem.com, super simple snowballsystem.com and that’ll have links to everywhere in the world. That’s five bucks. And I’m. The other place they might go is creating demand course.com. Create demand course.com. And that’s where they can sign up for free video-based training that we delivered right to their inbox. That’ll help them create demand for their services. Gene Hammett: Love it. Well, thanks for being here and thanks for sharing your insights here on leaders in the trenches. Mo Bunnell: Thanks, Gene It was fun. Gene Hammett: That was fantastic. I love doing what I do and I really appreciate you being here on the journey with me to improve your business, grow as a leader. If you want to sell more. This episode, we’re really helped. A lot of this was talked about, the mindset that it takes to be the salesman and be the leader that you need to be. If you were wondering to yourself if you could grow through thinking a little bit differently, seeing a new perspective. If you’re already feeling frustration with inside your role, then I’d love to get to know you. I’d love to, to talk about you and really find out about your business and see if We’re a fit for each other. My business is about helping you grow yours. I love growing businesses, but what I really love is helping people grow them themselves. So if you have any questions, make sure you reach out to me. [email protected] has always lead with courage and I’ll see you next time.